Thanksgiving is almost here – who’s excited?! I know I am. I love Thanksgiving. I love everything about it. I love that our focus is on being grateful, acknowledging the things we do have and not focusing on the things we don’t have. We also focus on family, on giving service and on being kinder to everyone. And let’s not forget the traditions. Some people watch football games all day. Some play games. Others put up their Christmas trees and decorations. Lots of people travel. Many people have the tradition of taking turns saying what they’re grateful for before eating the Thanksgiving meal. Let’s take that one step further. Why not do that every night for the entire month of November? Yes, I realize that November is almost over. I’m a big time slacker. I should’ve posted this right after Halloween. Still, there’s 9 days left in November. It’s not too late. So let’s do it! We started this tradition a couple of years ago and the kids love it so much that if I forget to do it, they remind me. We call it our Warm Fuzzy Jar. Here’s our jar. Nothing fancy or exciting. Just a plain jar with a bit of ribbon and a tag. Super simple, super easy. 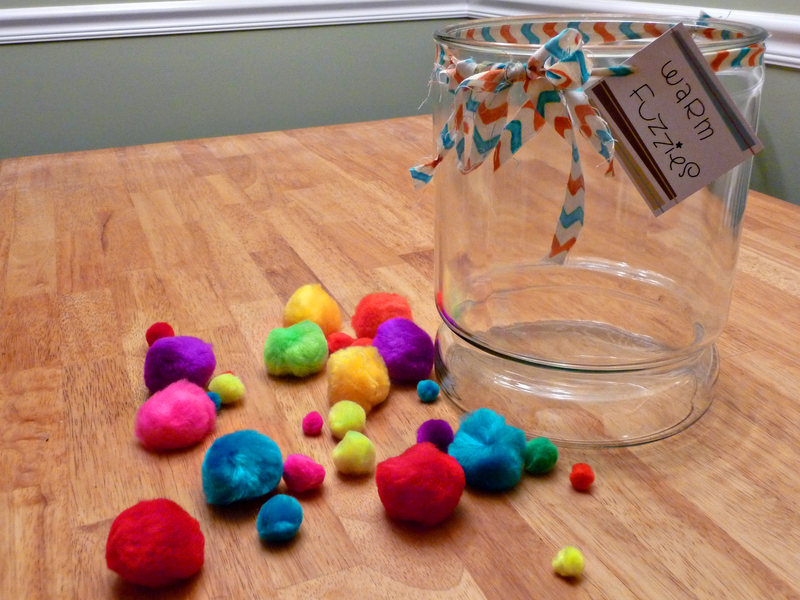 I bought a couple of packages of these puff balls at Robert’s Crafts (I used my 40% off coupon – gotta love that). That’s all there is to it to be ready to go. Every night when we sit down for dinner, each person has the chance to throw in 2 “warm fuzzies”. One for what we’re thankful for, and one if we did an act of service for someone. Our goal is to fill the Warm Fuzzy Jar by the end of November. Maybe I should buy bigger puff balls. I challenge you to do this for the remainder of this month. I think it’ll help add to the wonderful spirit of the season. This entry was posted in Holidays and tagged grateful, service, Thanksgiving, warm fuzzy jar. Bookmark the permalink.